Moving from one color or design element to another in a piece can be tricky business. In this session, TRANSITIONS AND BOUNDARIES, you will explore how various design techniques can be used to manage changes and help you create a piece where color and design move seamlessly throughout a piece. This workshop is one of four intermediate applied color and design workshops. You may take the four workshops in any order. 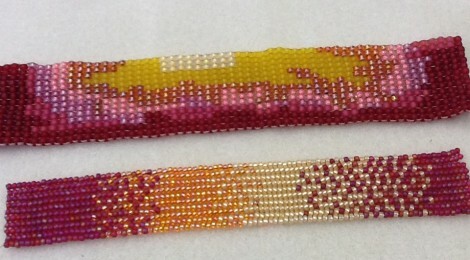 This class requires 2 prerequisite basic classes: Designing with Beads and Color Awareness. Bring: Handouts from Designing with Beads and Color Awareness workshops. Note taking supplies.